Sharks Join the Good Fight – Ya Like Dags? As some readers may be aware, lionfish are in the process of making a massive invasion into the Atlantic, dominating reefs in the Caribbean and southern U.S., and even appearing as far north as southern New England. JohnnyScallops has been following this story quite closely. Now it seems that divers in Honduras are enlisting a new kind of soldier in this war: sharks are being trained to feed on lionfish. Who's the dominant predator now!? Image by Antonio Busiello from National Geographic. 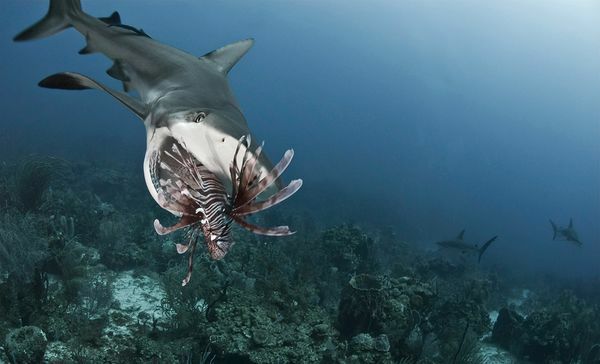 The story from National Geographic is that local divers began feeding lionfish to Caribbean reef sharks in the Roatan Marine Park in an effort to get the predators to develop a taste for the invasive species. They started with dead lionfish, then worked their way up to injured ones, and apparently now the sharks have been observed hunting and eating live, healthy lionfish. Sharks were chosen as the predator-in-training because of their ability to eat venomous prey like stingrays without any apparent ill effects. While it remains to be seen whether the sharks of Honduras will ever start consuming lionfish at a high enough rate to reduce their population, this does seem to be an encouraging start. If nothing else, it makes for great photographs.